Dream, Create, Inspire: Passionate About . . .
"Something you are passionate about." Lately I can't say I've really been passionate about anything in particular. I guess you could say I've lost my mojo. So much has happened this past year that it's left me kind of numb. I know this feeling will pass and something that has gotten me though the hard times is working in my journals. I enjoy anything to do with journaling - inspiration journals, art journals, writing journals, reading about journaling, looking at other people's journals, learning how to make journals, etc., etc. So I guess I'd be correct in saying that these days I am quite passionate about journals! Jag in there, Jeannie, this too shall pass. Mojo will return soon ... hope! Thats a good thing to be passionate about Jeanne! Im having trouble chosing something for todays topic too. but I think I'm going to run down to the lake and snap a pic. At this time of year that is my obsession! I hope you have a nice 4th of july. Give yourself a little break Jeanne...everything is still very fresh...journaling will help you process. And your journal looks beautiful! i think it has been amazing that mojo or no mojo (say that 3x fast), you have been creating and that's what's important. be busy, be connected. everything you create is lovely. It sure looks to me like you are in the process of picking up. Even the act of photography is a step in the right direction. I do understand, though, because I have lost my mojo, too, but I am becoming fascinated with the process of creating backgrounds so maybe mine is coming back little by little. I forget that I used to make jewelry. It's like, who's that person? Hang in there! 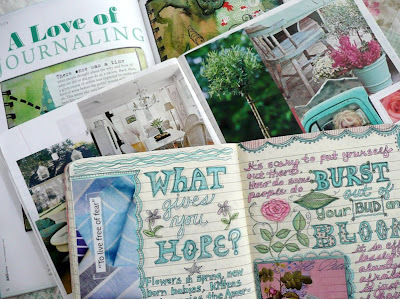 The journaling looks so good and so "artful."